The 30th of November marks six years since City of Heroes closed. Two years ago, we launched the Ship of Heroes website and announced that we were using the closed MMORPG as a major inspiration for a completely new game. CoH had many wonderful traits, one of which was how much fun you could have playing healers, buffers, controllers, and other non-DPS archetypes. Today we are releasing a video showing our first version of a new support powerset focused on healing and buffing, as an homage to CoH. Here's the video, or you can watch it and read more about the powers on the official Ship of Heroes website. 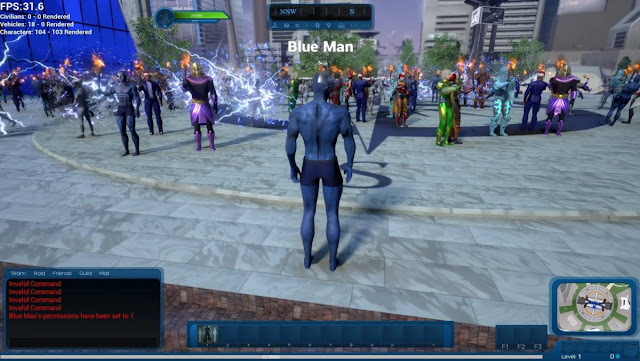 The controller in City of Heroes added a lot of options to any team, it looks as if Ship of Heroes similar class if going to be just as much fun to play. Restorative Nanites is likely to be more of a secondary power for most people, giving healing options to other classes. As a primary powerset, it's utility to a group will be indispensible when dealing with tougher enemies. The video also shows off a very nice looking character, Nicky Nanite. It's immediately obvious how much better this character looks than some of the others on earlier videos. Heroic Games are making amazing progress on Ship of Heroes, it looks better each time I see it. We're planning to do a Beta at the end of next month, of something. The likely candidates are a big raid, or the CCT upgrades. Beta for the entire game, with the mission system, leveling, augments, and the whole thing is currently planned for the end of next year. That launch has been pushed back by a few months (we were previously saying the middle of next year) because we now know more about what our schedule in 2019 has to contain. However, we will be doing more and more activities, in-game, with the community between now and then. Including letting supporters create characters and save names at some point between now and then. Things are looking pretty good from where I'm standing, or, more accurately, sitting. Heroic Games have released a newsletter in which they go into great detail about the work they are doing to ensure players have a great experience when playing. One of the challenges in MMO's is keeping response times and the graphical quality high enough to please players as more and more resources have to be displayed in real time. The developers of Ship of Heroes are taking this issue very seriously and have taken the unusual step, for a game this early in development, of telling us what they're doing to increase FPS (frames per second) and the results they are achieving. There's a lot of technical detail in the newsletter, far too much to go through here, you can read all about it on the official website. Of particular note is that they have achieved an FPS gain from 20 to 64 by modifying the character models and developing their CROM 4 system for map optimisation, they have done this with no loss of quality - a very important consideration in an MMO. We are currently planning 50-man invasions with 50-70 enemies as a typical maximum. If these FPS numbers hold up, we may be able to go even higher. Based on these tests, we think it is reasonable to assume that we can conduct a login test with 50-100 unique heroes, and that we can conduct a raid test with at least 50 heroes and 70 Nagdellians, with the expectation of success. An FPS test with 103 heroes and 103 Nagdellians under the Arch. FPS is 31.6. Here's the link to the associated forum post if you'd like to join in the discussion on this latest newsletter. Some of the FPS results are kind of startling. Screengrabs showing over 200 characters, in motion and using FX, in close proximity are highly unusual for MMOs at any stage of development. While this is testing, and not gameplay, the shots are still very compelling. This is a good sign for the MMO industry, which has been running into a rough patch lately. It seems likely, based on this data that SoH will be able to exceed the numbers of players that City Of Heroes could sustain on raids and invasions. This spiritual successor to the beloved superhero MMO is looking good. Nope, not the actual login test, don't get too excited :) Just news that Heroic Games have said they're looking to carry out a test in 2018 and they're now looking for a guide as to the numbers of people they can expect. If you're interested in logging in and having a chat ingame (there'll be no combat or anything like that - as the name suggests, it's just a test to see how their systems stand up to large numbers logging in) pop over to the official website and vote in the community poll to let them know your favourite day and take a look at the associated thread in the forum.